Kayak amongst the fjords of the Chilean Lake District, guided and supported by local experts. You'll be camping in the wilderness most nights (fully serviced) and be able to relax in the local hot springs after a day of kayaking. The trip starts with a climb up the Osorno Volcano. No previous experience required. Day 1: Puerto Varas - Llanquihue Lake. Transfer in from Puerto Montt airport to "The Guest House" in Puerto Varas. Free time to relax in this picturesque city in the Lake District with its century-old mansions, cosy restaurants and natural attractions along the shores of Llanquihue Lake. Welcome dinner and overnight in Puerto Varas. (D). Day 2: Full Day Excursion to Andean Volcanoes and Lakes. We leave Puerto Varas driving through the beautiful countryside with views of the Llanquihue Lake and the first glimpses of the volcanoes, we reach the Petrohue river and then continue on to the source of this beautiful river: the Todos Los Santos Lake also called the Emerald Lake. After lunch we will start driving up along the Osorno Volcano witnessing the southern changes in the landscape as we go up. At 3000 feet, we reach la Burbuja Crater, where an amazing view of the whole valley is available; the Calbuco Volcano, the Tronador Mountain, the winding path of the rivers, etc. Overnight in our hotel in Puerto Varas. (B,L). Day 3: Puerto Montt - Llancahue Island. After breakfast in the hotel we drive down the Southern Highway, and cross the Reloncavi Estuary to Hornopiren. There we board our support vessel and head for Los Ciervos Island. After stopping for lunch in a nice cove, we sail on to Llancahue Island, where we climb into our sea kayaks for instruction and practice. 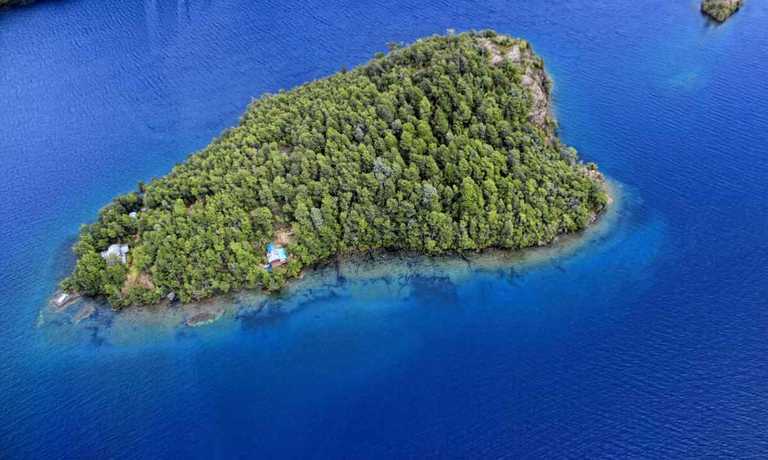 Afterwards, we camp for the night on this island. (B,L,D). Day 4: Llancahue Island - Quintupeu Fjord. Now we begin the wild part of our sea kayak adventure. We get into our kayaks near the entrance to the Quintupeu Fjord, where the German battleship Dresden hid during World War I. The sheer slopes on the banks of the fjord, cut by countless waterfalls tumbling off the heights, are covered with lush vegetation that hangs over our heads. As we glide along under this lush canopy, we try to catch a glimpse of dolphins jumping near our kayaks. At nightfall, we camp at the end of the fjord. (B,L,D). Day 5: Quintupeu Fjord - Cahuelmo Fjord. We navigate down to Cahuelmo Fjord, stopping at the entrance to see if there are any sea lions at play. We don't stop for long though, because we want to paddle to the far end of Cahuelmo in time to get up the river, or hike through the wild tidal flats. Finally, we take a relaxing dip in Cahuelmo hot springs before turning in for the night. (B,L,D). Day 6: Cahuelmo Fjord - Porcelana Bay. Our goal for today's journey is Porcelana hot springs. On the way, we stop at the settlement of Huinay and hike up a glacial valley sourrounded by snow capped mountains. From this village we cut straight across Comau Fjord to Porcelana, where we pitch our tents in a lush green pasture. (B,L,D). Day 7: Porcelana hot springs - Comau Fjord. We paddle down to the end of Comau Fjord to Leptepu, passing by stunning snow-capped peaks on our way to a secluded corner in a setting of plunging waterfalls and virgin forests. 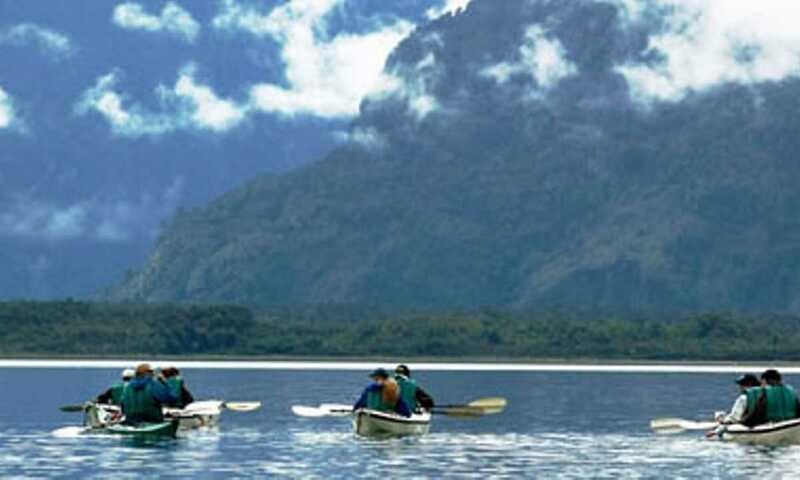 We also see a lagoon, teeming with wildlife, which we can reach by kayak at high tide. In the afternoon we return to Porcelana and head for the tidal pools of hot water surrounded by magnificent scenery. (B,L,D). Day 8: Comau Fjord - Hornopiren - Puerto Montt. This trip can run as a group trip, with prices starting from $2,240 per person for a complete group. If you are looking to join a group or you are a solo traveller we will help to form likeminded groups of travellers. Please let us know your travel plans.